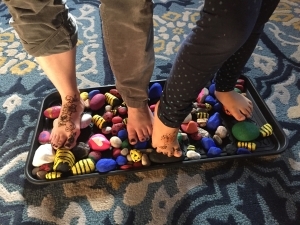 Cami and me exploring sensation through our feet! It is a rare day, indeed, that I disagree with my idol Mark Twain. And while I know he is referring to feeling in a different context than what we perceive and sense in the world around us, I’m not sure we stop and feel enough. And it may just be our ability to feel that keeps us thinking. It may surprise you to learn that one of my favorite birthday presents this year was a box of rocks. 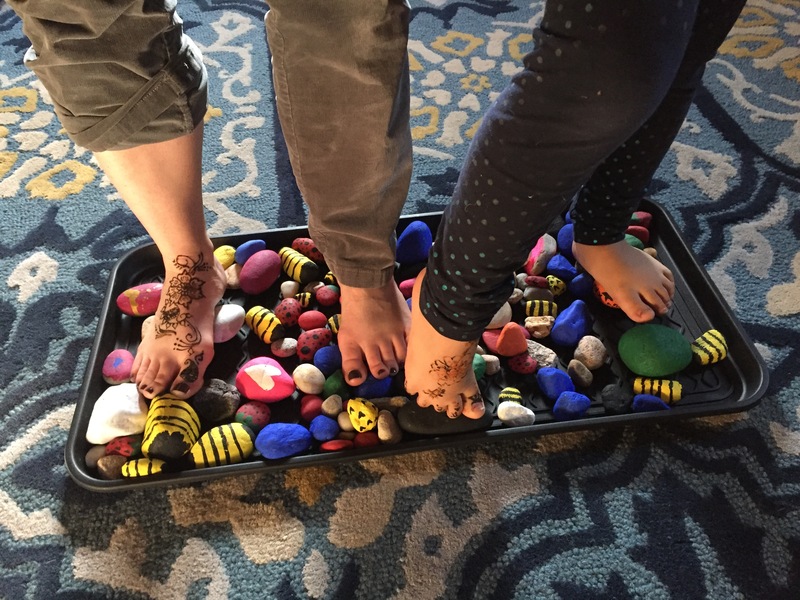 My partner-in-movement, Cate Vallone, from Evolution Pilates and her daughter painted a bunch of small rocks for me. They painted bees, strawberries, little hearts, random colors It was utterly unexpected which made it grand. If you’re going to out shopping and waiting in lines today, don’t feel discouraged. Make good use of your time. Lift your kegel while in line. Engage your core–pull your belly button to your spine. Feel your abdominals engage all the way to your pubic bone. Stand tall with your shoulders back and down. It is one of the many challenges in Pilates: to move and hold still at the same time. Yet that is one of the aspects of Pilates that makes it so unique and provides you with so much control. The 100: You move your arms, but try not to move the rest of you body, espeically the rest of the upper body. Leg Circles: You move your leg in the hip socket, but try not to let the opposite side of you pelvis lift. Spinal Rotation: You twist at the spine without letting your hips move with you. Can you think of another exercise in Pilates that requires you to move and hold still at the same time?